General Hospital (GH) spoilers reveal that Andre (Anthony Montgomery) will continue to play a role in the twin mystery. He tried to wash his hands of this mess, but he won’t be able to stay out of it for long. 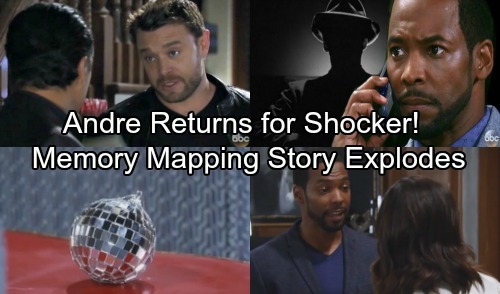 There are a few reasons why Andre will get pulled back into the drama. First, there’s Andre’s boss. Will the person behind the twin study really just let him slip away? The mastermind means business, so he or she doesn’t want anyone wiggling out of his or her duties. Even if no one manages to catch up with Andre, the threat will be in the back of his mind. The pressure could start to get to him. Next, we have curious Anna (Finola Hughes). She’s wondering just how shady Andre is, but she probably can’t buy that he’s a true baddie. Based on how things played out, Andre seems like a good guy who made a bad decision. He let his desire for scientific breakthroughs cloud his judgment. Andre got caught up in seeing if he could pull off memory mapping. He didn’t stop to think about if he should! That brings us to the most important reason why Andre will remain in this storyline. 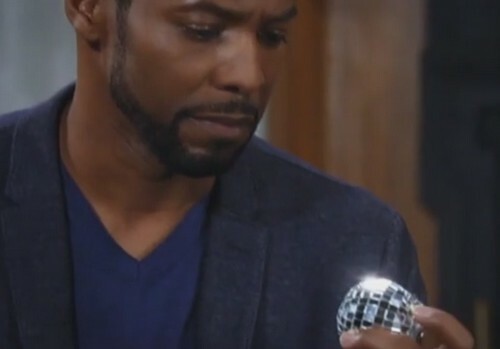 General Hospital spoilers hint that guilt will be a huge problem for Andre. He’ll try to go on his merry way, but regrets may stop him. Andre has a fake passport and plans for a new life, but can he truly ignore the disaster happening in Port Charles? It appears Andre will hope to clear things up sooner or later. Fortunately, Andre may have left behind some evidence of the study. We’re not talking about the document Franco (Roger Howarth) burned. We’re talking about extensive proof that could change everything! 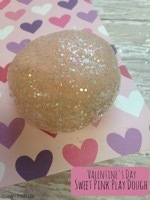 Remember that mini disco ball Andre gave Anna? Perhaps Andre will send word that Anna should look inside it. It may contain a chip that could explain the situation. Andre could even turn himself in down the road and offer his side of the story. It sounds like some fun material’s coming up. We’ll give you updates as other General Hospital news comes in. Stick with ABC’s GH and don’t forget to check CDL often for the latest General Hospital spoilers, updates and news.